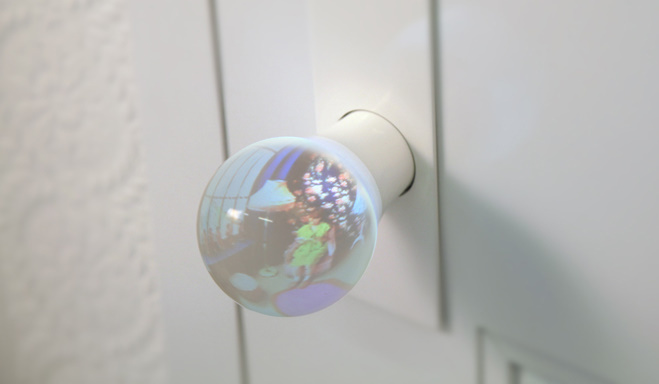 In conjunction with Design Tide Tokyo, architect Hideyuki Nakayama – a protégé of Toyo Ito –　has teamed up with UNION, a manufacturer of door handles and levers, to create a glass globe doorknob. As you approach the doorknob you catch a glimpse of what appears to be another world, waiting for you to enter and join, but in fact is a reflection of the room on the other side of the door. It’s wonderful how simple secular objects can be reinvented in such unexpected ways. And so useful. People can block noise from outside and won’t get bothered by anyone if they’re busy. No need to open the door to check if someone is working or relaxing. For privacy: just put a cloth on the knob on your side. Just a thought: In this case, the affordance might be lost..